Looks just as great today as it did when it was originally released, last year. 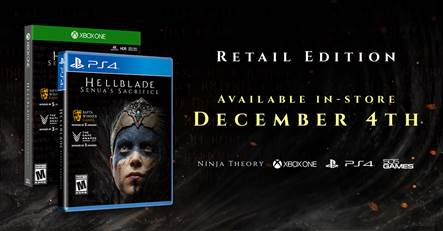 There’s no denying that Ninja Theory crafted one gorgeous game with Hellblade, though it’s more than just that. Senua’s Sacrifice is a deeper game than most. At first glance, it’s lush and detailed world is the stage for a straightforward action-packed quest with monsters aplenty. But it goes deeper then just that. Hellblade is also an exploration of mental illness. So, bottom line, if you missed it the first time, then you’ll want to take a look at round two. The game will be making the jump from digital to physical, retail edition this December the 4th. You can grab a copy on the PS4, or for the first time on the Xbox One, which will be distributed directly by Microsoft.